Pascal Dagnan-Bouveret (1852–1929), Une noce chez le photographe (A Wedding at the Photographer's) (1879), oil on canvas, 120 x 81.9 cm, Musée des Beaux-Arts, Lyon, France. Wikimedia Commons. For nearly two centuries, painting and photography have co-existed, not always peacefully, though. We are used to seeing photographs of painters at work, and there are plenty of paintings of painters painting, but paintings of photography are more unusual. Perhaps the photographers were always in such a rush that they couldn’t wait for the painter to transform their canvas into an image. Charles-Amédée-Philippe van Loo (1719–1795), The Camera Obscura (1764), further details not known. Wikimedia Commons. 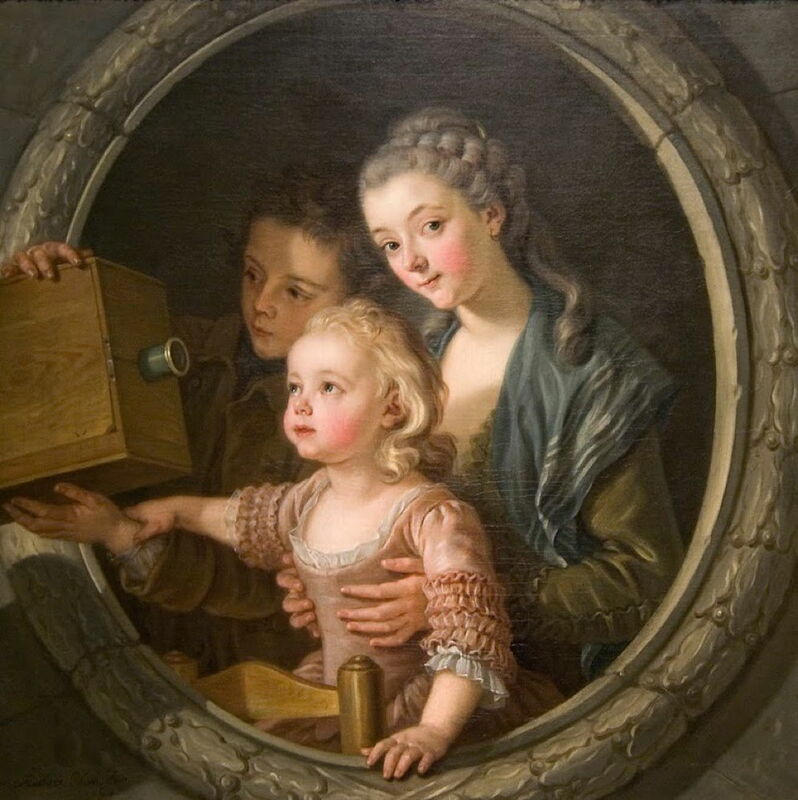 But painters have long had an interest in optical devices, as shown in Charles-Amédée-Philippe van Loo’s delightful trompe l’oeil The Camera Obscura from 1764. I don’t find this at all surprising, nor that many famous painters have had, and used, cameras obscura. When much of your life is about images, any device which creates images is surely just the sort of technology which would fascinate. Wojciech Gerson (1831–1901), W Tatrach (In the Tatra Mountains) (1860), watercolour on paper, 17.3 x 19.6 cm, Muzeum Narodowe w Warszawie, Warsaw, Poland. Wikimedia Commons. The Polish artist Wojciech Gerson was one of the earliest painters to include a photographer in a painting, in his watercolour In the Tatra Mountains from 1860. 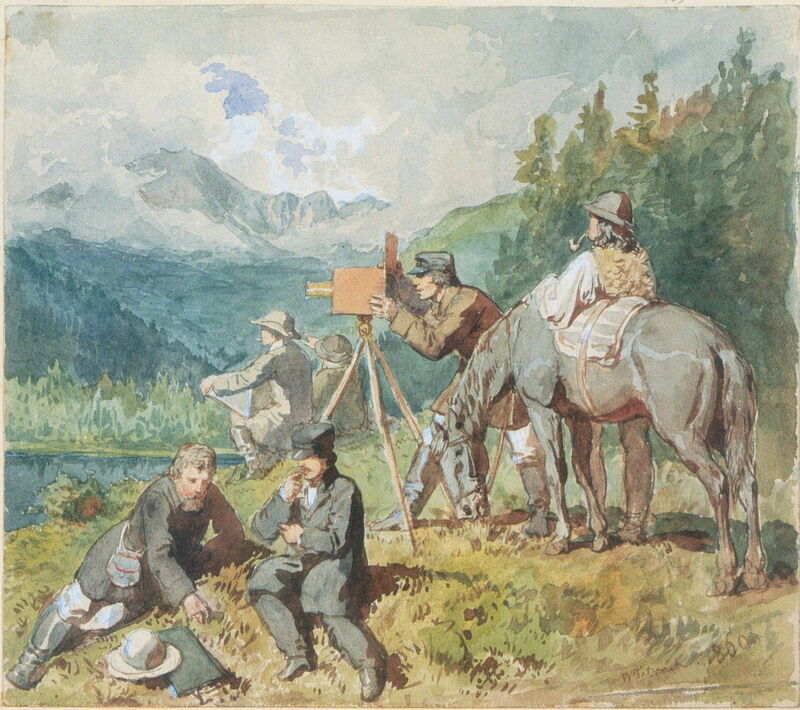 This shows a team of surveyors and explorers at work in the Tatra Mountains, during the campaign in many European countries to produce high-quality maps, mainly for military purposes. In Britain, for example, national mapping is performed by the Ordnance Survey, whose original purpose was to perform military surveys for the use of the artillery. Frederick Daniel Hardy (1827–1911), The Young Photographers (1862), further details not known. Wikimedia Commons. 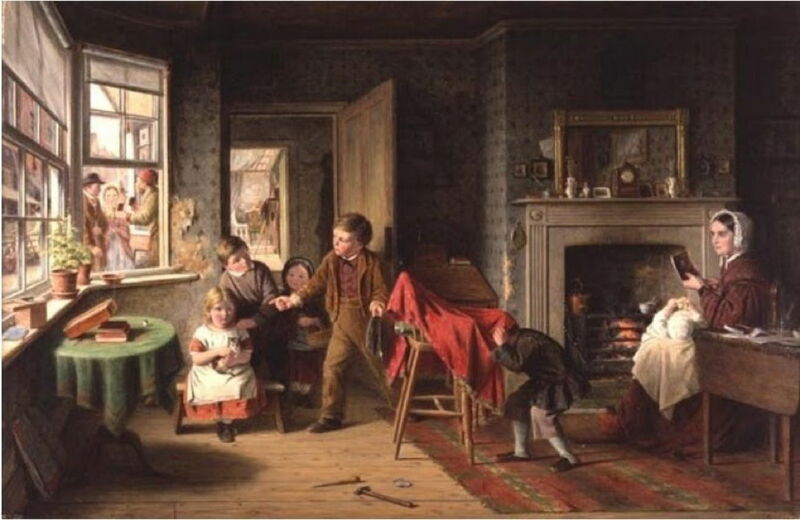 The camera in Frederick Daniel Hardy’s The Young Photographers (1862) is almost hidden beneath the bright red cloth covering it and the photographer. The message that photography was just child’s play may not have been what he intended, and wasn’t true at that time. Thomas Le Clear (1818–1882), Interior with Portraits (c 1865), oil on canvas, 65.7 x 102.9 cm, Smithsonian American Art Museum, Washington, DC. Wikimedia Commons. As photographic portraits became popular in the middle of the nineteenth century, and every town had its own photographic studio, painters seemed happy to paint them. 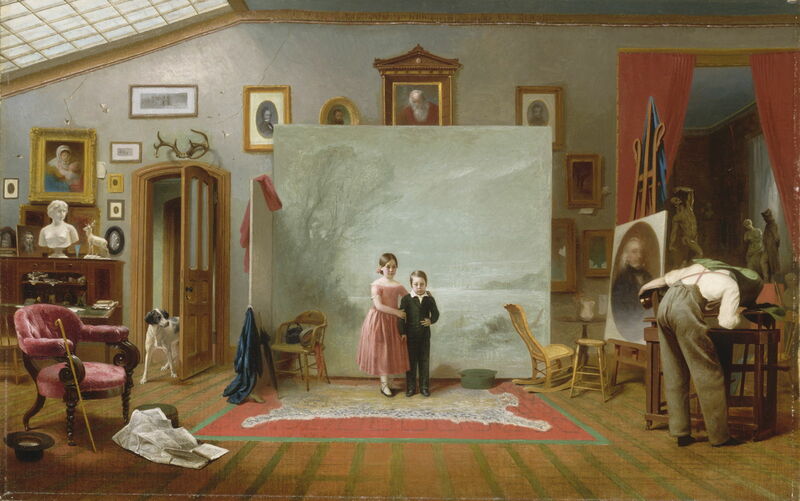 Thomas Le Clear’s Interior with Portraits from about 1865 captures the atmosphere and props well. Once again, the photographer and his camera are almost hidden from view and Le Clear’s attention is focussed on the two children who are frozen in front of the lens. Paintings of photography seem to have peaked around 1870, when the latter was still relatively novel and unusual, and not perceived as much of a threat to the painter. Philipp Sporrer (1829-1899), The Photo (1870), oil on canvas, 81.5 x 63.5 cm, location not known. Wikimedia Commons. 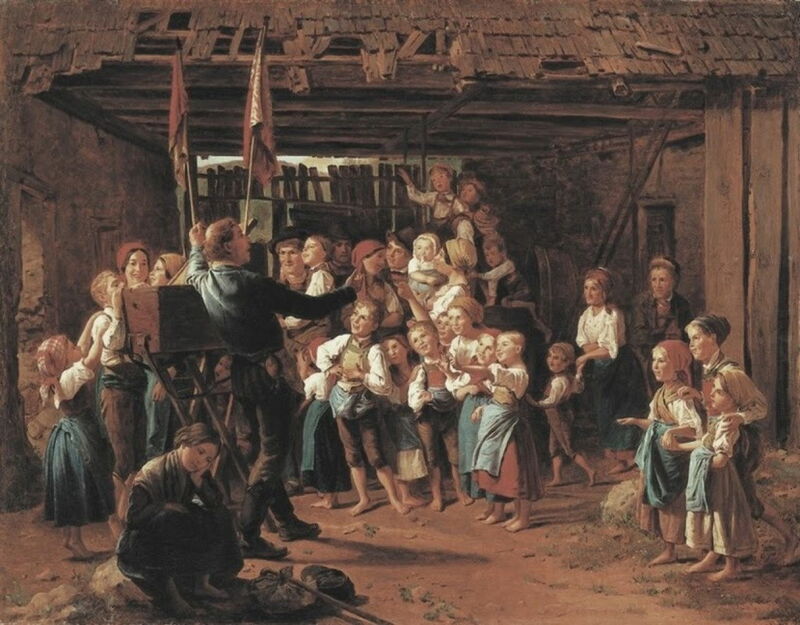 Philipp Sporrer’s The Photo (1870) is probably the most pointed painted propaganda. The young photographer is not the sort of man you would leave your wife or daughter with: he is down at heel, unkempt, and his straw hat is abominably tatty. His studio is poorly-lit, probably an old shed, its floor littered with rubbish, and its window broken. His subject is manifestly poor and uncouth, sitting in ill-fitting clothes and picking his nose as he waits for the photographer to fiddle around with his equipment. 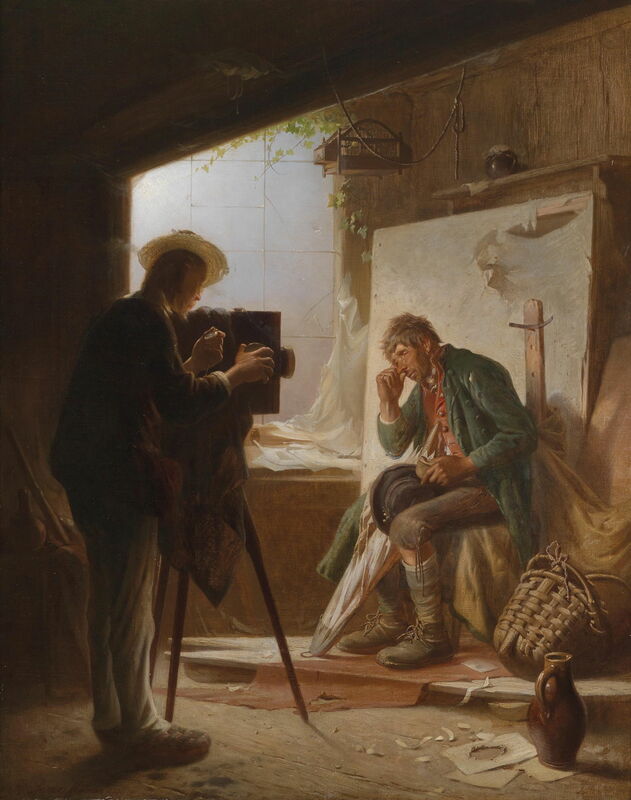 Lajos Bruck (1846–1910), Fényképész (The Photographer) (1870), oil on canvas, 74 x 94.5 cm, Private collection. Wikimedia Commons. 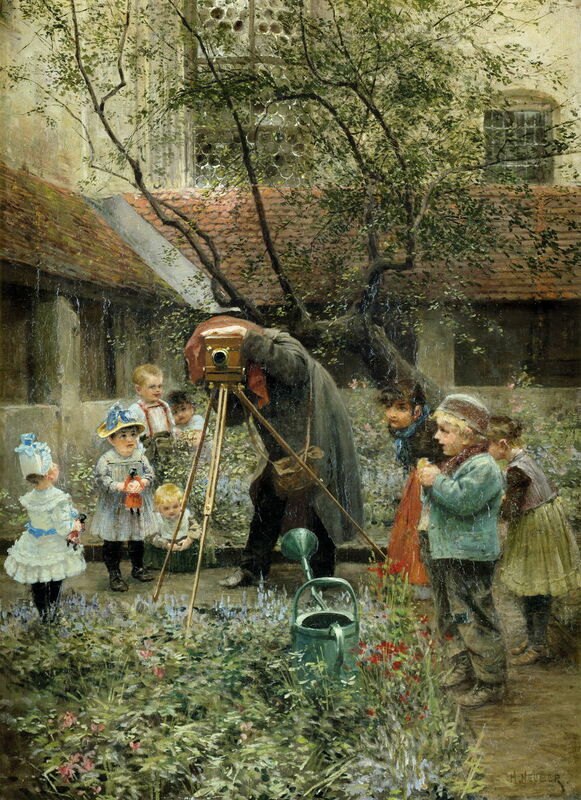 Lajos Bruck’s The Photographer (1870) is perhaps fairer to the new medium, with a whole village and their innumerable children being cajoled into smiles ready for the camera. The itinerant photographer’s partner, though, seems disinterested, as she sits resting her head against her hand and looking away. Franz Schams (1824-1883), Radovedni čuvaj (Curious Guard) (date not known), oil on canvas, 40 x 31.5 cm, University of Ljubljana, Ljubljana, Slovenia. Wikimedia Commons. 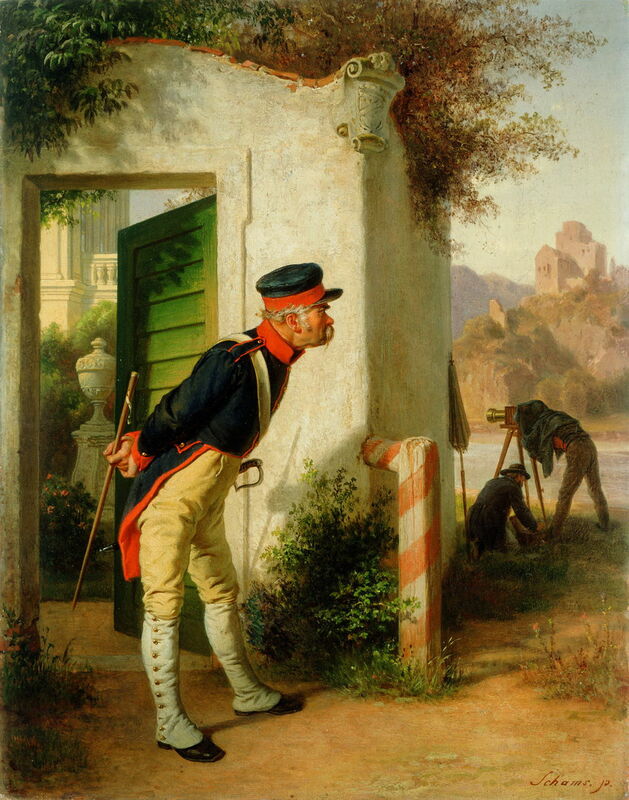 Then there are more neutral depictions, like Franz Schams’ Curious Guard most probably from around 1870. Once again, the photographer and his camera are largely concealed, as if photographers consisted only of buttocks and legs, and had no head. Pascal Dagnan-Bouveret (1852–1929), Une noce chez le photographe (A Wedding at the Photographer’s) (1879), oil on canvas, 120 x 81.9 cm, Musée des Beaux-Arts, Lyon, France. Wikimedia Commons. 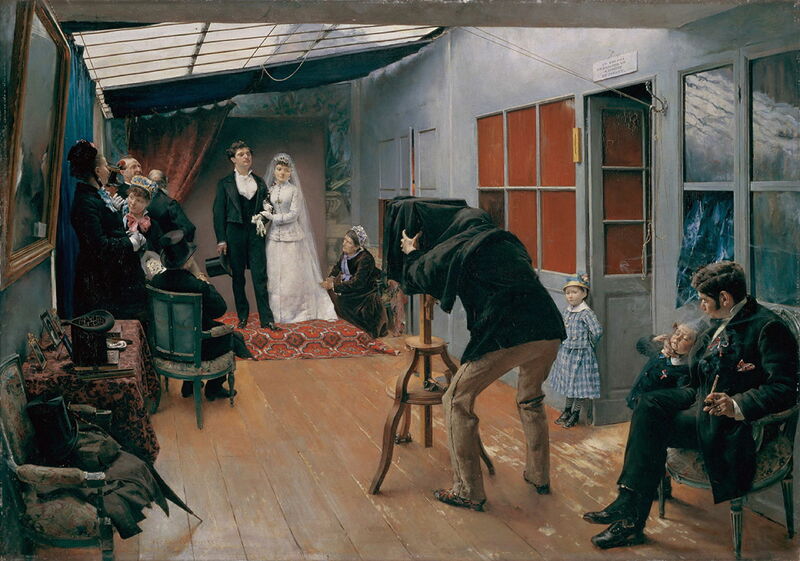 Pascal Dagnan-Bouveret’s A Wedding at the Photographer’s (1879) seems more calculated. Hugely successful at the Salon, this artist saw no threat from wedding photography, a market in which there was no competition between painting and photography. But he still takes the opportunity to show the photographer and his studio as being tatty and tawdry. 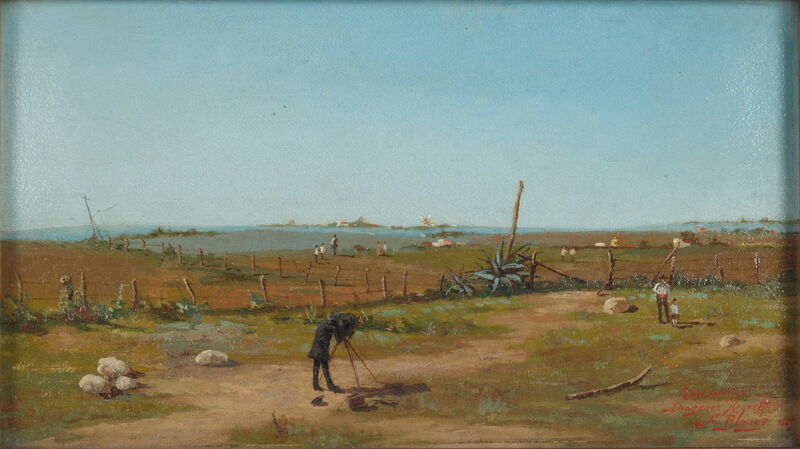 Nicanor Blanes (1857-1895), Bella Vista (1889), oil on cardboard, 20 x 36 cm, Museo Nacional de Artes Visuales de Uruguay, Uruguay. Image by Eduardo Baldizan, via Wikimedia Commons. Nicanor Blanes’ excellent plein air painting of Bella Vista (1889) is a fairer match. Hermann Neuber (1860-1916), The Photograph (c 1890), oil on canvas, .73 x 53 cm, Private collection. Wikimedia Commons. The only painting that I have found which really matches the two media is Hermann Neuber’s The Photograph from about 1890. Here the photographer is taking a photo of the painter, who is painting the photographer … and a strategically-placed watering can looks as if it is poised to soak the photographer. Louis Muraton (1850–1919), The Photographer (before 1901), further details not known. Wikimedia Commons. None of those paintings looks at the other, more technically-demanding side of photography: developing plates and printing. That is the subject of Louis Muraton’s The Photographer, which was painted before 1901. The subject is rocking a glass plate in a bath of developer, in his improvised darkroom. 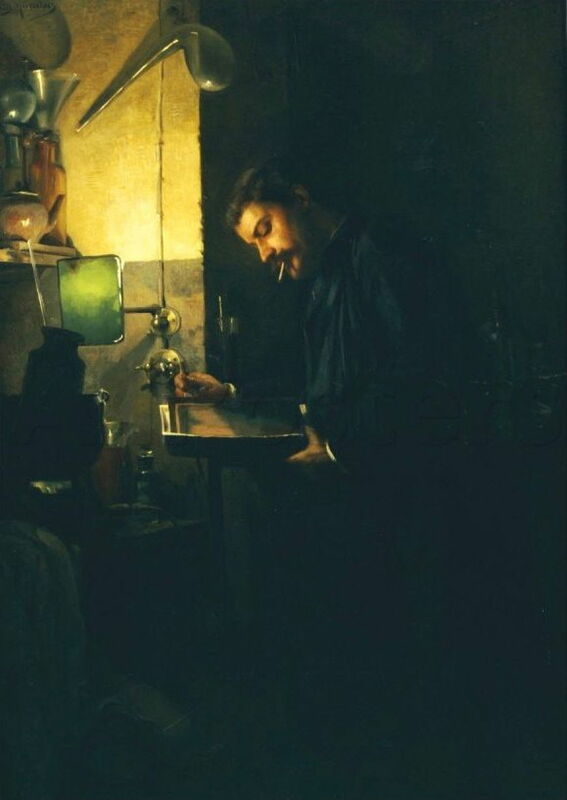 Joaquín Sorolla (1863–1923), The Photographer Christian Franzen (1903), oil on canvas, 100 x 66 cm, Biblioteca de Castilla-La Mancha, Toledo, Spain. Wikimedia Commons. 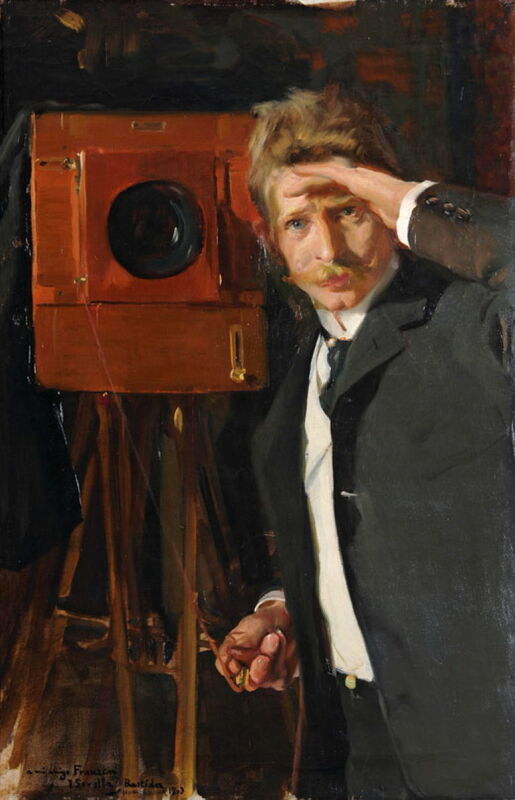 The last image, though, speaks clearest: Joaquín Sorolla’s portrait of The Photographer Christian Franzen (1903). Franzen (1864-1923) was Danish by birth, trained in Copenhagen, then worked throughout Europe until he established his studio in Madrid in 1896. He was then appointed court photographer to King Alfonso XIII. By then, photography had became an art in its own right, not the pale imitation depicted by Philipp Sporrer or Dagnan-Bouveret. But the top photographers still liked to have their portraits painted. Posted in General, Life, Painting, Technology and tagged Blanes, Bruck, Dagnan-Bouveret, Gerson, Hardy, Le Clear, Muraton, Neuber, painting, photography, Sorolla, Sporrer, van Loo. Bookmark the permalink. Wonderful juxtaposition: you’ve given us a delightful exercise in crossing the lines.